For what does the contraction "T4" stand? What is this homepage all about? Many questions, but I do not want give no answers. 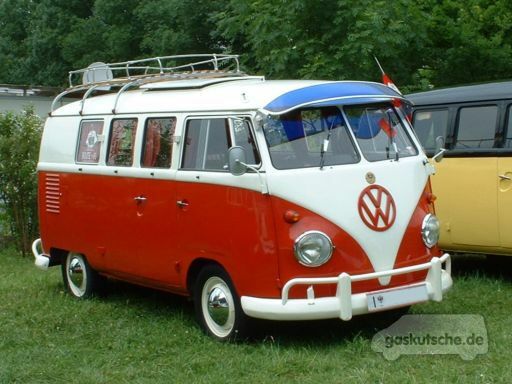 We catch simply with the first question to and therefore a small historical hour over the Volkswagen bus, also affectionately »Bulli« mentioned here in germany. Even if the owners it actually to know should become many penalty wrongly offered. 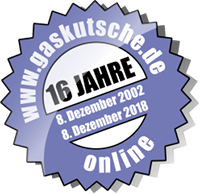 At least I was allowed to make this experience with on-line offers like the popular german online carsales mobile.de and autoscout24.de. Actually everything is completely simple: »type 2« is the name for all of the busses. The first model was called »T1« and got replaced by the »T2«. Simply increment the number with each new model and you got it. The only problem that stays: Some can't correctly count from the first model up to the desired model. The vehicle shown in the picture runs and runs and runs in Norway. The T2 can be divided into three further variations. The T2A was built to approximately 8.71. It is easily to recognize on the basis the small tail lamps as well as the turn signal scarcely over the bumper. Subsequently, there was a "intermediate series", which is called T2A/B. This had the turn signals near to the bumper but already the large tail lamps and other (more bulge) wheel arches. Starting from 8.72 up to end the T2 in 8.79 the T2B was built. This varant had the turn signals on the left and right beside the air intake (to see in the following three pictures). Thank you at "Buskonne" for these informations. 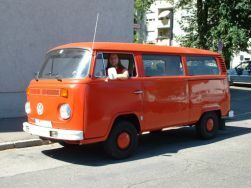 The Bulli is a former german fire-fighting vehicle – even if red color seems to be orange at the picture. 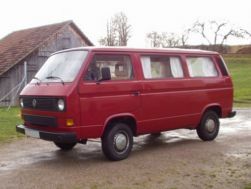 Also much likes: Camping vehicles with a type 2 T2 as basis. Here one picture I took on Crete. 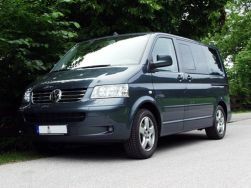 Here a transporter with the so-called »short front«. Easily to recognize by the »angular« headlights and the orange turn signals. The type 2 T4 with the »long front« has, in contrast to evenly the illustrated with »short front car«, an slightly »angry face expression« and in series clear turn signals in europe. 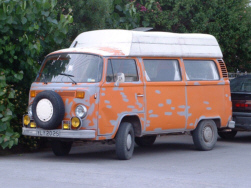 The T4 »Eurovan« in the United States has orange turn signals. The original organization for the vehicles read as follows: The Type1 was the »beetle«, from first to the last crawling animal. With Type2 and all busses are ment. Type3 were the 1600 models. 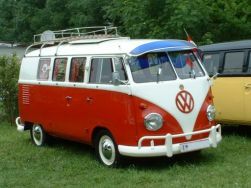 The type 2 was divided into different models by Volkswagen. The transporters changed their appearance in the run the time. Every new model got it's own number. 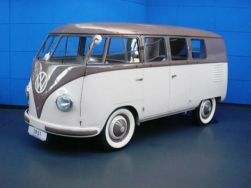 The first type 2 was called thus internally more exactly »Typ 2 T1« and was built from 1949 to 1966. 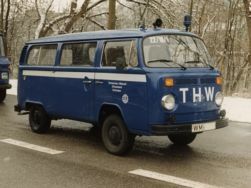 The T2 was built in the years 1967 to 1979 and got replaced by the T3 in the year 1979. 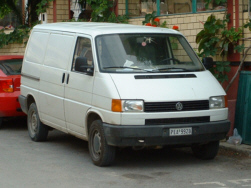 The »cubical« T3 Transporter was the last Volkswagen bus with rear propulsion. 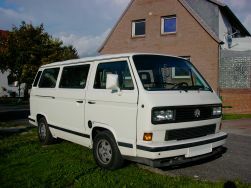 The T3 was built in the years 1979 to 1992 in Germany, but the last copies of the model were produced in South Africa till the production stopped in the year 2002. The type 2 T4 hat it's introduction already in the year 1991. 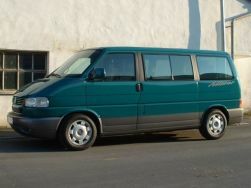 The newest Volkswagen bus is produced since 2003, and carries the designation »Typ for 2 T5«. 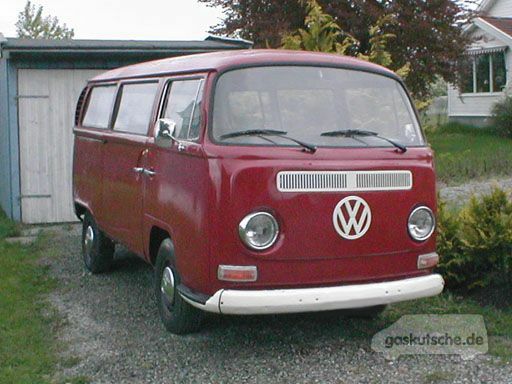 The »Microbus« is already in planning. A couple of months before I wrote these lines (more exactly said on the 11th of june 2002) the confirmation that the »Microbus« will be going to be built in Hannover, Germany. The start for the production was indicated at the end of of 2004. First picture of the classic »Bulli« was shot by »Golf Kitcar«. He was able to take the picture at the Volkswagen museum. The picture of the »THW Bulli« (»Technisches Hilfswerk«) was sent to me by »Zauder«. 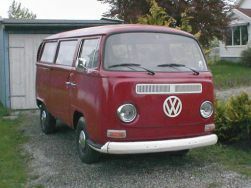 The picture of the red T3 originates from the collection from Christoph Boltze. The other picture of a T3, the »Whitestar«, was given to me by Fabian Stille. Final words: Yes, the green T4 is of course mine. All the other pictures were taken by myself.